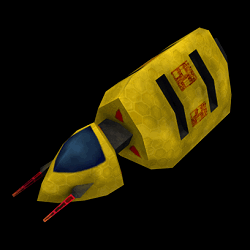 Furthering my research / practice into low-polygon 3D modelling is this attempt at a space faring transport vessel. Actually, it was originally intended as a combat cruiser, but it doesn't look anywhere near menacing enough. Its loosely based off a fleet I made for Space Empires IV, a set of designs that ended up as the 'Neo Utopian Brotherhood', or NUB. The Nub were first conceived on holiday across the sea when I had nothing but pen and paper to keep me amused. The fleet was created using Moray, and the vessels constructed from four intersecting spheres. Complicated. This newer model was built up point by point, face by face, joining extra bits on as I went. Actually, thats not true. It has rotational symmetry of 3, I drew the outline from the side, and then rotated it along nose-to-tail padding out the points. After putting the model together, I then extracted and positioned all the faces on a texture map, (called a UVW mapping). I then exported the wire-frame mapping (the outlines) as a guide for texturing the model. I ran out of stuff to put on the texture, I'm a bit limited at that stage - never quite sure what I want or how to go about adding it. Anyhow, the model is highly optimized I guess, it has only 388 polys and looks much better from the rear. The gormless back-section really needs livening up, I'll see if I can compact the design to make it more sleek, menacing, interesting and purposeful.